Angelprints Jewelry makes beautiful, custom one of a kind pendants in sterling silver from an impression of your thumbprint or fingerprint. The Angelprints Silver Thumbprint Jewelry is a precious and unique keepsake of your child, your grandchild, your mother, your lover, your best friend, or your beloved pet. It captures the energy and love of the person in a piece of jewelry. It’s a beautiful way to stay connected with someone you love. Angelprints Thumbprint pendants can be made in sterling silver, gold or platinum and diamonds scan be added. They can be worn with a silver or gold chain, or with a simple leather cord. 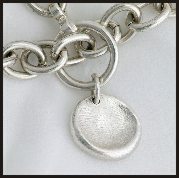 The finished thumbprint or fingerprint pendants have a wonderful, soft, organic look and feel to them. Their shape reflects the beauty of the loved one they represent. Angelprints Silver Thumbprint Jewelry is a unique, personal and meaningful gift. Clients are very touched when they see the finished silver thumbprint of someone special. It becomes a treasured piece of jewelry to which nothing can compare. It is a gift that will be remembered and cherished.